This movie already resonates with me. Or at least the scene represented in the still below. And I haven’t even seen it. It’s just that both of my children were born less than nine months after undefeated Auburn football seasons (of which there are 12, not four). So the wife and I expect to see tons of Auburn flags when we’re expecting. 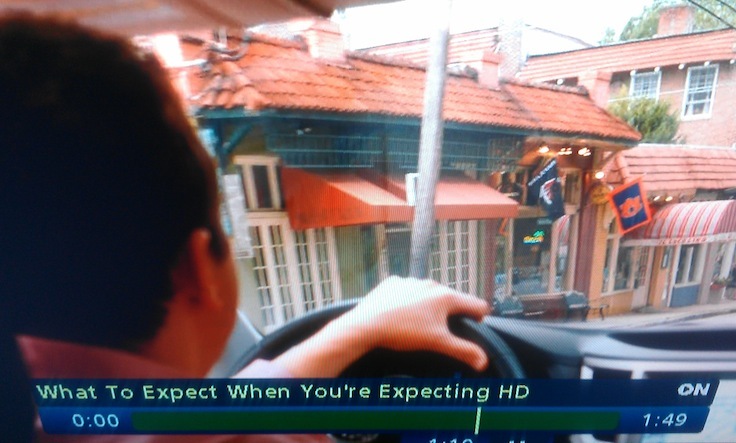 We also expect to see lots of Auburn flags when we drive through Atlanta, which is where star-packed, pregnancy-sure-is-wacky rom-com What To Expect When You’re Expecting started filming less than nine months after Auburn’s latest undefeated season. Eagle Eye Award to Josh Holman, h/t: @FearlessandTrue. Related: Robert DeNiro’s War Eagle Wager in Casino. That’s the North Highland Pub in Atlanta. I pass that place all the time and have had the pleasure of enjoying an Auburn game from there, WDE!! watched a couple 2010 games there as well as The Blessed Individual’s Heisman Celebration. they’ve been flying that same flag for quite some time now. Watched the 2010 SECCG there. I don’t watch movies, but if I did, I’d watch this.